I haven’t been blogging like I need to be. I’ve been avoiding it. Recently I had a conversation with a member of my bio family, granted it was necessary, it isn’t something that happens very often. During the conversation, which was pleasant, I received the information they wanted me to know; however, once I started to speak about what is new and has been happening to me, other than my current weight loss, nothing else was acknowledged. I shook my head as I am reading the replies to me and I began to think to myself, when will there be acknowledgement? My mental health and eating disorder aren’t going to go away. I will always have triggers, but I am always going to improve my negative thoughts as I learn to understand them better. I mentioned that my medication protocol has been changed; but it fell on deaf ears. At first I felt slighted, but with the guidance and support of my husband, I realized that to not be able to see past your own blinders, is sad. Sad that the fear of acknowledging that your daughter does have a mental illness, does have an eating disorder and she IS doing something about it, is nothing to be embarrassed about. My husband said that he is very proud of me and continues to be a huge support network to me as well as friends. 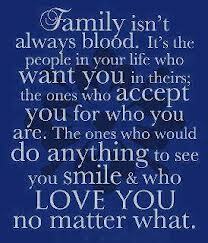 I have realized that family doesn’t have to mean blood.